The devastating California wildfires should completely erase any skepticism about the crisis of climate change. 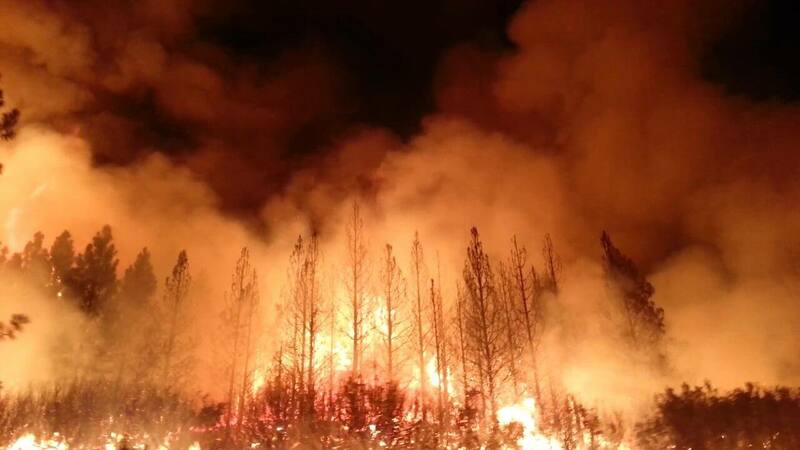 However, President Trumps suggested that the fires resulted because America isn’t raking its forests and dismissed climate change as a major cause. It seems incomprehensible America could have a Commander-in-Chief so ignorant of science or the basic facts about forest management and climate change. While visiting fire devastated areas in California last week, Trump suggested he got the raking idea after talking to the President of Finland. Following Trump’s statement, the Finnish President denied ever promoting raking as a forest fire prevention. However, that didn’t stop Trump. In an interview on FOX News with Chris Wallace, Trump again came out as a forest raking advocate. Putting aside Trump’s ridiculous raking claims, the real effects of climate change have made California hotter and drier than ever. Western wild fires are growing bigger and consuming more acres each year. Since 2000, California has experienced 15 of the 20 largest fires in its history. Its annual average temperatures have increased 3 degrees Fahrenheit over the last century. Simultaneously, California has had multiple years of drought which has lengthened the dry season each year. Autumn rains are coming later in the season, sometimes not until November and December. It’s clear Democratic Governor Jerry Brown believes California warming and fires result from climate change and aren’t related to raking their forests. While California burns, Trump and most of the Republican Party remain silent about the growing threat of climate change. Blaming the fires on poor raking habits is the latest excuse for a party held hostage by the fossil fuel industry. NEXT POST Next post: The Beginning Of The End For Steve King? Trump got you again with this silly rake B S . It’s nothing more than just another diversionary tactic so democrats can go off on a tirade . What we need is to get back into the Paris climate agreement and that wont happen till the work gets done on electing the next new and vibrant batch of democrats in 2020 . The battle for political control is not over . Maybe he could volunteer for the USFRS (United States Forest-Raking Service). But then again, with all that hot air emanating from his mouth, he probably should stay well away from anything flammable. are so many great hockey players from Finland. Raking really builds up the upper arm muscles. Arrrrgh. Trump thinks Finland’s boreal forests are the same as the mediterranean forests of California. The gross ignorance, it burns. Literally. Of course he and many others are carefully avoiding any discussion of the two enormous elephants in the room. One is climate change, of course. But the other is that local governments in California control most land-use decisions and they keep letting individuals and entire communities rebuild in areas that have burned before and will definitely burn again. And much of that rebuilding is generously subsidized by the feds, meaning U.S. taxpayers. And instead of requiring the new rebuilt homes to be more fire-safe than the old ones, requirements for the new homes are sometimes reduced to lower the cost of rebuilding. It’s crazy. Bloomberg had a good story about the problem just a few months ago, with interesting facts and stunning maps. Apart from the huge tragic loss of human life, the resulting fire destruction is insanely expensive. In case anyone wants to skim, here ’tis. As an aside, I’ve worked on prescribed fires in Iowa, and part of that work was raking firelines. When working on prescribed fires, you want to work with people you can depend on, people who have common sense. I know some people with different political views than mine who would be great to work with on fires. But Donald Trump? NOT.